Kisan Vikas Patra is a saving scheme that was announced by the Government of India that doubles the money invested in eight years and seven months. The Directorate of Small Savings Government of India, sells these saving bonds through all Post Offices in the country so that the scheme can be accessed by citizens from all over the country. 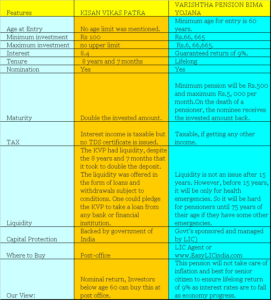 A KVP can be encashed after two and a half years from the date of issue at the value it has been bought and the interest accrued for the period. The “kisan” in Kisan Vikas Patra does not mean that only farmers can buy these saving certificates but means that the revenue mobilized by this scheme will be used by the Government of India in welfare schemes for farmers. Any individual can safely invest and save their money in the form of Kisan Vikas Patra. Ceiling of maximum pension is for a family as a whole i.e. total amount of pension under all the policies issued to a family under this plan shall not exceed the maximum pension limit. The family for this purpose will comprise of pensioner, his/her spouse and dependants. The plan can be purchased by payment of a lump sum Purchase Price. The pensioner has an option to choose either the amount of pension or the Purchase Price. The Purchase Price to be charged shall be rounded to nearest multiple of Rs.5/-. The modes of pension payment are monthly, quarterly, half-yearly & yearly. 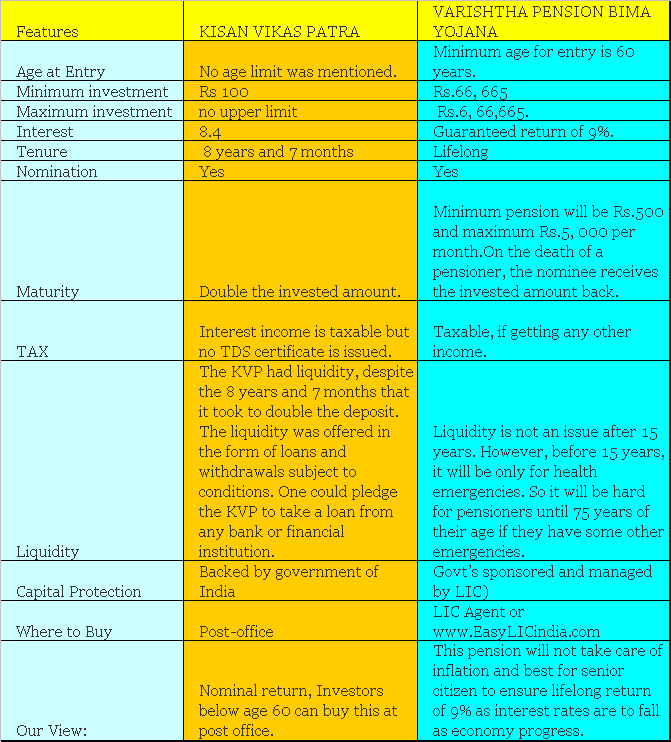 The pension payment shall be through ECS/NEFT only. These rates are not age specific. The policy can be surrendered aftercompletion of 15 years. The Surrender Value payable will be refund of Purchase Price. However, under exceptional circumstances, if the pensioner requires money for the treatment of any critical/terminal illness of self or spouse then the policy can be surrendered before the completion of 15 years and the Surrender Value payable shall be 98% of Purchase Price. Taxes including Service Tax, if any, shall be as per the Tax laws and the rate of tax as applicable from time to time. The amount of tax payable as per the prevailing rates shall be payable by the policyholder on Purchase Price. The amount of Tax paid shall not be considered for the calculation of benefits payable under the plan. The amount to be refunded within free look period shall be the Purchase Price deposited by the policyholder after deducting the charges for Stamp duty.